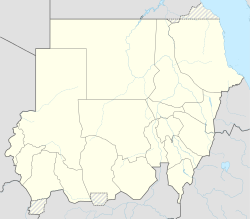 Buhen was an ancient Egyptian settlement situated on the West bank of the Nile below (to the North of) the Second Cataract in what is now Northern State, Sudan. It is now submerged in Lake Nubia. On the East bank, across the river, there was another ancient settlement, where the town of Wadi Halfa now stands. In the Old Kingdom (about 2686–2181 BC) it was the site of a small trading post in Nubia that was also used for copper working. The settlement may have been established during the reign of Sneferu (4th dynasty). Nevertheless, there is evidence of still earlier, 2nd dynasty, occupation at Buhen. An archaeological investigation in 1962 revealed what was described as an ancient copper 'factory'. Graffiti and other inscribed items from the site show that the Egyptians stayed about 200 years, until late in the 5th dynasty, when they were probably forced out by immigration from the south. Buhen is known for its large fortress, probably constructed during the rule of Senusret III in around 1860 BC (12th dynasty). Senusret III conducted four campaigns into Kush and established a line of forts within signalling distance of one another; Buhen was the northernmost of these. The other forts along the banks were Mirgissa, Shalfak, Uronarti, Askut, Dabenarti, Semna, and Kumma. The Kushites captured Buhen during the 13th dynasty, and held it until Ahmose I recaptured it at the beginning of the 18th dynasty. It was stormed and recaptured by indigenous forces at the end of Egypt's 20th dynasty. The fortress itself extended more than 150 metres (490 ft) along the west bank of the Nile. It covered 13,000 square metres (140,000 sq ft), and had within its wall a small town laid out in a grid system. At its peak it probably had a population of around 3500 people. The fortress also included the administration for the whole fortified region of the Second Cataract. Its fortifications included a moat three metres deep, drawbridges, bastions, buttresses, ramparts, battlements, loopholes, and a catapult. The walls of the fort were about 5 metres (16 ft) thick and 10 metres (33 ft) high. The fortress at Buhen is now submerged under Lake Nasser as a result of the construction of the Aswan Dam in 1964. Before the site was covered with water, it was excavated by a team led by Walter Bryan Emery. Buhen had a temple of Horus built by Hatshepsut, which was moved to the National Museum of Sudan in Khartoum prior to the flooding of Lake Nasser. ^ Gayar, El Sayed El; Jones, M. P. (1989). "A Possible Source of Copper Ore Fragments Found at the Old Kingdom Town of Buhen". The Journal of Egyptian Archaeology. 75: 31. doi:10.2307/3821897. JSTOR 3821897.